Here we acknowledge the part played by coaches in developing our tourist industry, and the Royal Tiger is one of the outstanding vehicles in the Transport Museum collection. Motorised tourism in this country began with solid-tyred charabancs well before the first World War, a second generation of similar vehicles on pneumatics taking over during the 1920s. In an extinction akin to that of the dinosaurs in its abruptness, the charabancs were eclipsed by more up-to-date transport, known at the time as all-weather coaches. These in turn gave way fairly rapidly to sun saloons, vehicles with sliding roofs and very comfortable seating, earning them the appellation of luxury coach. Body builders vied with each other, as did operators, to produce the most hedonistic coaches and some magnificent examples were to be found on our roads prior to World War Two. When CIE was formed in 1945 it took over the GSR coaches, eight of which could be considered as first line vehicles. It took some time for tours to be reinstated and the pre-war petrol-engined Leyland Tigers soldiered on for a few years. By 1948, CIE was building new diesel Tiger half-cab buses with highly standardised body framing, and as a stop gap twenty of these were upgraded in 1949, being fitted with coach seats. 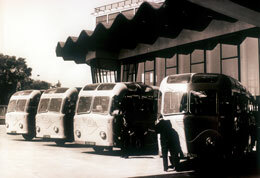 The following year, ten full-fronted versions appeared, signalling the revival of coach tourism and twenty more were built in 1950. 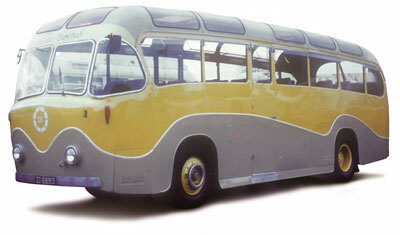 Full-size front-engined buses became obsolete almost overnight when models with underfloor power units became available from 1950 onwards. 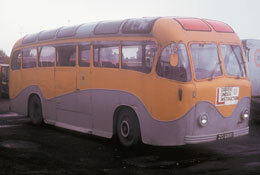 While service buses with the traditional layout could be phased out over a period of years, coaches had to be replaced as soon as possible and so it was that in 1953 CIE placed an order for Leyland Royal Tigers. This massively over engineered and virtually indestructible chassis had the trusty 9.8 litre Leyland O.600 engine, now lying horizontally between the front and rear axles, driving through a four-speed synchromesh gearbox. A truly modern and highly distinctive body design, owing more than a little to Southdown Motor Services styling, was built at Spa Road for the Royal Tiger. Thirty feet (9.1m) long and having seating capacities ranging from 30 upwards according to the work they were intended to do, these vehicles were an instant success. They were turned out in a livery of primrose and lavender and quickly became known as Banana Boats. This affectionate title arose from the Banana Boat song, one of several chart toppers recorded by Harry Belafonte in the infectious calypso rhythm so popular at the time. The Royal Tigers were numbered U1-U50 and had registration numbers ZO 6872-Zo 6921. Ireland's tourist industry moved into a new phase during the 1950s, thanks to intensive marketing and the success of The Quiet Man. 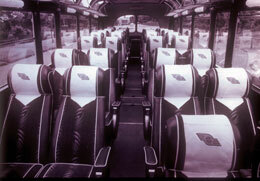 A feature of the Royal Tigers that appealed greatly to tourists was that each coach was named after an Irish river. Such names had been carried by the earlier Tiger coaches P161-170 and P271-290, but it was on the Royal Tigers that they became really well known. Thirty names of our best known rivers, originally given to the older coaches, were transferred to the new vehicles, which were initially intended to be called after mountains. Our vehicle (U10, The Owvane) was one of the coaches employed in the Driving School where it had a very long innings, not being retired until the mid-1980s. On withdrawal, it came into the museum collection and drove faultlessly to Castleruddery for storage one glorious summer day in 1989. Before the coach was put away, an effort was made to create and photograph a rural Irish scene that could have come from thirty years earlier and it turned out well except for an anachronistic public lamp bracket. U10, the only surviving Banana Boat, a most important survivor hidden away for more than eleven years, should ideally be on display. It represents an era of great hope in the Ireland that slowly emerged from the shadows of gloom, economic depression and civil war politics nearly fifty years ago. It is a memorial to those whose confidence and hard work did so much for both our economy and our national self-confidence all those years ago. Arguably one of the vehicles on which our modern tourist industry was built, it straddles several strands of social, technological and economic history. Above: Ready for a day’s work  Banana Boats at Store Street in the 1950s. Above: The interior of a Banana Boat when new. 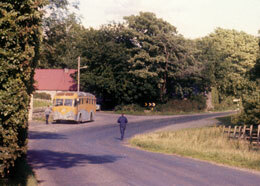 Below: U10 (The Owvane) in Driving School mode about 25 years ago.